High performance, cost effective exterior: Lignin-based carbon fibre has a 50% lower finished cost than current materials. Cellulose nanocrystals reinforce paints and coatings for improved scratch resistance. Lightweight and durable interior: Wood fibre mats mould into products like dashboards and door panels that are 40% lighter than current materials. Cellulose nanocrystals or lignin-based bioplastics produce strong yet lightweight interior components like door handles and instrument panels. Greener tires: Lignin replaces petroleum-derived carbon black for lighter tires, improving fuel efficiency. Advanced technology: Paper-thin and flexible electronic displays and abrasion-resistant transparencies are made from cellulose nanocrystals. 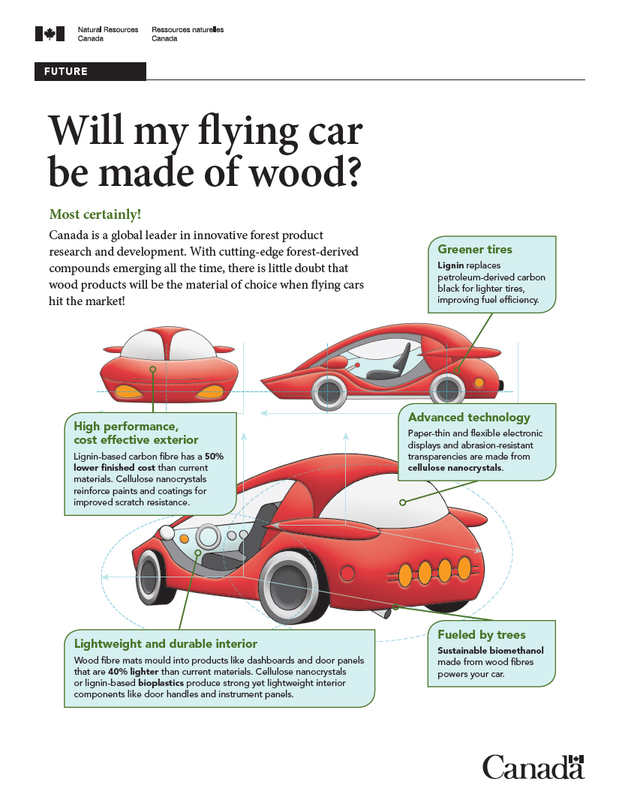 Fueled by trees: Sustainable biomethanol made from wood fibers powers your car. Click here to take a peek at the car of the future.